I think I know what you refer to Richard. I think you are thinking of Bobbetty-Shooty which is not the name of the Devil but a name for Hell. It occurs in what many consider the very best of the old Punch Scripts. It is the one by Robert Brough in 1854. 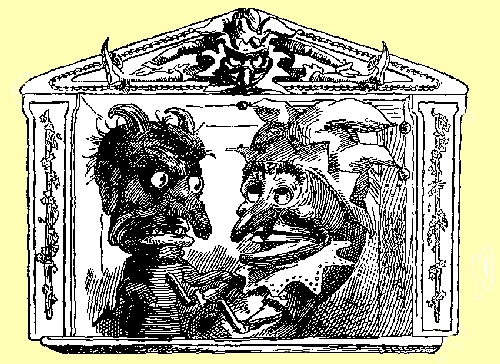 It is reproduced as an appendix in George Speaight's "Punch and Judy, a history". George Speaight and rival historian Michael Byrom differed on many aspects of Punch but they did agree that this was the very best Punch script. PUNCH (alarmed) Who are you? THE HORRID, DREADFUL PERSONAGE (in a terrible voice) "Bogy!" PUNCH "Oh dear, what do you want?" BOGY. "To carry you off to the land of Bobbetty-Shooty, where you will be condemned to the punishment of shaving the monkeys." There is at least one of the regular performers at the May Fayre who do use "the land of Bobbetty-Shooty and shaving the monkeys" in their script. So if you haven't actually read this script Richard, you may well have heard this bit of it. As for the "shaggy fur type of body" - well I've certainly seen that somewhere. I think I recall a photograph of a German marionette devil from a Faust play, which was dressed in black shaggy fur. 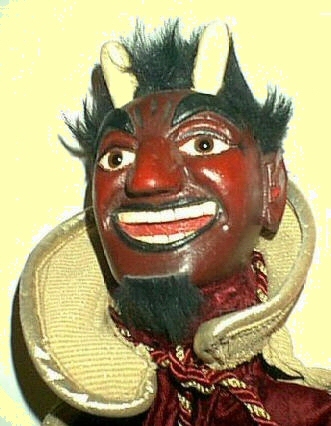 The trouble is that modern kids don't really recognise the Devil as a character even in stereotypical form and if you gave him fur you'd really confuse the little dears. Mine has fangs (its based on Peter Frazer's lovely drawing) and the kids think it is a Vampire. This is a devil head design I rather like - not at all scary but the kind I remember from pantomime or from magician's posters. As always Chris , you are spot on with your Punch knowledge. Yes that is where I Mallapropped the phrase from. 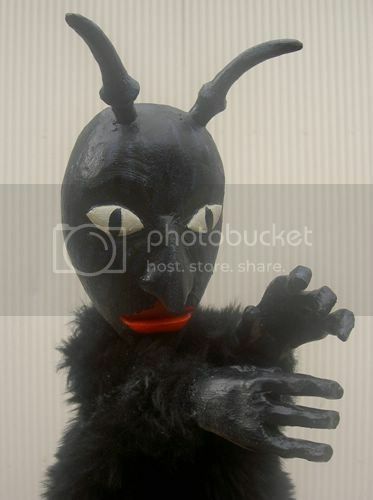 It was photo page in a puppet book that was in the Library when I was a kid ...might have even been a colour plate , my hazy memory is that the face was black also like the fur ...but despite the figure being nearly all black it was a colour photo as certain accented parts were red I think ...eyes possibly ? .. could be wrong though. And yes , i like that devil face too , thanks for posting . Some lovely devils appearing here. I thought I'd add my own current devil. The switch for the light up eyes is in the front of the costume so that it can be operated with the hand that is in the devil. Very nice Miraiker - I love the flame effect colouring of the face, and the goblin ears. It's amazing how kids notice detail. I have a skeleton which has chrome buttons set in the eye sockets and this is always mentioned by the kids - usually they ask how I make the eyes flash. I imagine the kids will love light up eyes. One of the wonders of modern photographs is the automatic elimination of "Red Eye". Thus, I notice that the photo doesn't show the rather bright red colour of the lights. Chrome is an excellent idea in ghost ideas. It catches the light really well. I might try that myself if you don't mind. Don't mind at all - I think I used blazer buttons. I suppose you have a button box? At one time every household did, but that was in the days when people mended clothes and darned the holes in socks and sweaters. I inherited my mother's button tin. Another effective thing I've used on marionettes - on a female puppet perhaps - is to set a tiny diamonte into the eye instead of a white highlight. Somewhere I've got a box of broken costume jewellery which I plunder for puppet decoration etc. Eric used to have big facetted costume jewellery diamonds in his skeleton's eyes which flashed beautifully. Looks rather like an insect don't you think? I guess any puppet maker will tell you that when it comes to the Devil it is all in the detail. They should mate! Can you imagine what a blend of giant ant and electrocuted sheep might produce? Chris wrote: This is a devil head design I rather like - not at all scary but the kind I remember from pantomime or from magician's posters. I like it a lot as well. Yes, it reminds me of the villainous magician from Aladdin, somewhat. Very nice. CvdC wrote: I guess any puppet maker will tell you that when it comes to the Devil it is all in the detail. The Mouse Devil: Bane of all cats! CvdC wrote: Punch confronts his demons. Add 2 more and you can have the personification of Mr. Punch's 7 Deadly Sins!